Today I am sharing with you this new series I’m starting called feeding a young student athlete. It has to do with how I pack Bryce’s lunch for school. I am not sure how many I will do in this series, but for now I’m enjoying it! This whole lunch packing thing is new to me!? With Bryce being homeschooled for the past couple of years I never had to worry about packing him a lunch, except on Fridays when he had his on-site class. Also last year at this time he wasn’t playing a physically intense sport like tackle football. That being said it is so important the food choices I pack him in his lunch and what snacks to pack too. His body is physically tired when his head hits the pillow at night and in the morning when he wakes up for school, he’s still tired. When he gets home from school he takes a nap for about an hour to an hour and fifteen minutes to rest up before a two hour practice. When he wakes from his nap he usually has a “light-dinner” about 45 minutes to an hour before practice, so he can refuel and have energy. ALSO I am proud to say he is pretty much off of soda (yay!) and doesn’t even ask me for soda at restaurants! Water, Water….Water!!! I pack Madison the same lunch too when she has her 2 preschool days, just smaller portions. She is physically active ALL DAY long and burns up a lot of fuel, so it’s important I pack her a good lunch too. 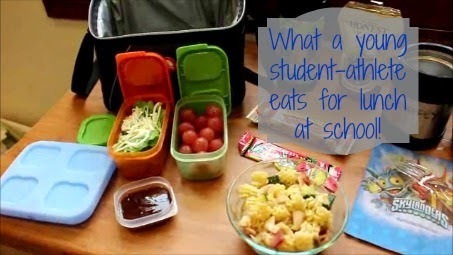 Here is a video I am sharing with you on how I pack his lunch and a little recipe tutorial on the pasta salad the kiddos love! By the time Bryce gets to middle school the poor guy will be rolling an ice-chest behind him! Ha! Hope you all have a GREAT Sunday-Funday and if you liked these style posts, I have more planned. p.s. I miss posting more but, I am trying to get this new schedule down!